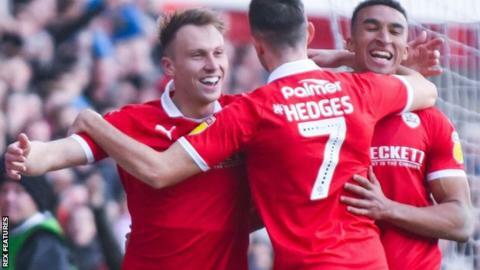 Cauley Woodrow scored both goals as Barnsley strengthened their grip on second spot in League One with a home win against Wycombe. Barnsley's Daniel Pinillos saw his low shot deflected wide before the hosts took the lead. The goal came from a 13th-minute penalty, as Woodrow scored from the spot after Luke Bolton was penalised for his foul on Mike Bahre. Pinillos' deflected long-range effort was then palmed wide by Ryan Allsop. Wycombe went close to equalising when Nick Freeman's shot forced a good save from Adam Davies. At the other end, Alex Mowatt wasted a good chance just before the break when he shot straight at Allsop from close range. Ryan Hedges and Jacob Brown then combined to set up a second goal for Woodrow, who fired into the roof of the net after 64 minutes. Woodrow went close to a hat-trick with a header which was tipped over by Allsop. Wycombe had skipper Adam El-Abd sent off deep into stoppage time following an off-the-ball clash with Cameron McGeehan. Joe Jacobson scored a consolation penalty at the death for the 10 men after Ethan Pinnock fouled Scott Kashket, but Barnsley had already done enough. Match ends, Barnsley 2, Wycombe Wanderers 1. Second Half ends, Barnsley 2, Wycombe Wanderers 1. Cauley Woodrow (Barnsley) wins a free kick on the left wing. Foul by Daniel Pinillos (Barnsley). Jason McCarthy (Wycombe Wanderers) wins a free kick in the attacking half. Goal! Barnsley 2, Wycombe Wanderers 1. Joe Jacobson (Wycombe Wanderers) converts the penalty with a right footed shot to the bottom right corner. Penalty conceded by Ethan Pinnock (Barnsley) after a foul in the penalty area. Penalty Wycombe Wanderers. Luke Bolton draws a foul in the penalty area. Attempt missed. Alex Samuel (Wycombe Wanderers) right footed shot from the centre of the box is too high. Foul by Kenneth Dougall (Barnsley). Joe Jacobson (Wycombe Wanderers) is shown the yellow card for a bad foul. Ryan Hedges (Barnsley) wins a free kick in the defensive half. Cameron McGeehan (Barnsley) is shown the yellow card for a bad foul. Alex Samuel (Wycombe Wanderers) wins a free kick in the attacking half. Jason McCarthy (Wycombe Wanderers) is shown the yellow card for a bad foul. Daniel Pinillos (Barnsley) wins a free kick on the right wing. Foul by Jason McCarthy (Wycombe Wanderers). Liam Lindsay (Barnsley) wins a free kick in the attacking half. Foul by Jacob Brown (Barnsley). Substitution, Barnsley. Kenneth Dougall replaces Alex Mowatt. Cauley Woodrow (Barnsley) wins a free kick in the attacking half. Foul by Adam El-Abd (Wycombe Wanderers). Attempt saved. Nathan Tyson (Wycombe Wanderers) right footed shot from the centre of the box is saved in the top centre of the goal. Substitution, Barnsley. Victor Adeboyejo replaces Mike-Steven Bähre. Jason McCarthy (Wycombe Wanderers) wins a free kick in the defensive half. Cauley Woodrow (Barnsley) wins a free kick in the defensive half.